Life: a user’s manual is a series of performances that exposes and examines the hidden stories captured by private wireless CCTV streams and how they are overlaid with the more tangible and perceptible spaces of the city. The title Life: a user’s manual is taken from a novel of the same name by Georges Perec. In his novel, he peels away the outer wall of a ten story building in Paris and proceeds to describe the interior of each apartment and the stories of its inhabitants. As observers, we are led through a sequence of readings and views as we mentally navigate from one apartment to the next. A tiny fraction of the radio spectrum has been allocated for public use. Taking advantage of this unlicensed part of the spectrum, the result has been an increase in use of wireless devices that are transmitting on this narrow band. The culmination of these autonomous and synchronous acts contributes to an invisible, ad-hoc network of media overlaid upon the socially codified spaces of urban environments, the café, the home, the apartment building, the office, the store, the bar, the hallway, the entrance, the parking lot and the street. Life: a user’s manual focuses on the use of wireless surveillance cameras within public and private places that transmit on the unlicensed 2.4 Ghz frequency band. Whether intended or not, a person that plugs in a wireless surveillance camera becomes a broadcaster who transmits live video out into the streets. 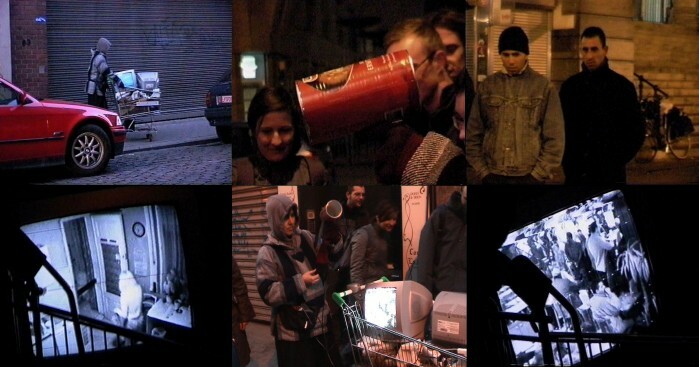 Walking through the streets and carrying a video receiver, an alternate view of the city and its inhabitants starts to unfold, created by these anonymous and unofficial broadcasts. During each performance, the public is invited on tours through the city and shown different surveillance views. A nomadic, female character walks through a city carrying a video scanner and uses it to intercept live surveillance transmitting from public and private spaces. These live images are visualized on a mobile display, a shopping trolley, a wooden cart, a suitcase, etc. Revealing hidden layers and forbidden fragments, she pieces together unseen stories from the invisible media present in the city. Nominated for Transmediale Award, honorary mention Interactive Arts category for Prix Ars Electronica. Comments closed — Trackback URI RSS 2.0 feed for these comments This entry (permalink) was posted on Friday, February 27, 2009, at 2:17 am by admin. Filed in Performance.